Hi there, my darlings! This afternoon, I'm super excited to introduce you to a brand-new indie line and that too by fellow beauty blogger of color, Vick of Vickermania--Majestic Lacquers! I'm really pleased that she reached out to me to swatch for her and I can't wait to show you all her first beautiful creations! Green Goddess is described as "muted seafoam green with gold shimmer and flecks". Fantastic formula and application--creamy, smooth and opaque in 2 coats, as shown below, topped with 1 coat of ellagee's Fast Dry Top Coat. This wore a tad bit bluer on me but I love this shade! Heartbeat is described as a "clear base with a mix of black, white, blue and hot pink glitters and hot pink heart glitter." Shown below is 2 coats of Heartbeat dabbed on Green Goddess, topped with 1 coat of ellagee's Fast Dry Top Coat. 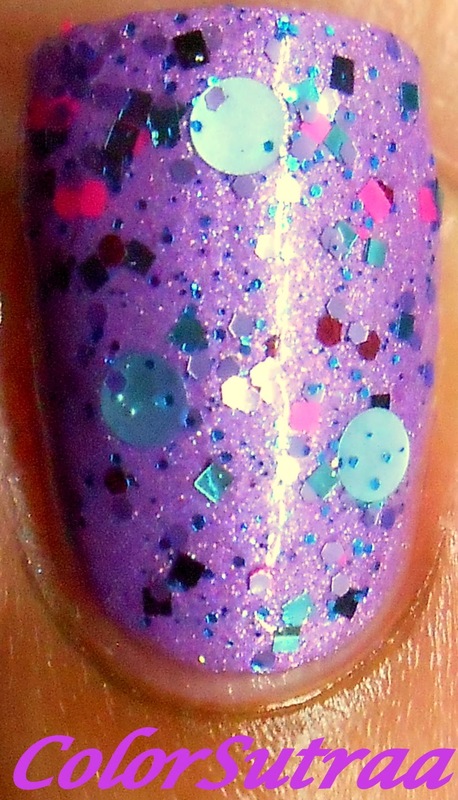 Again, fabulous formula--I didn't have any issues with getting any of the larger glitters out, even from my mini bottle. I LOVE how this look turned out! Honeymoon Avenue is a lovely, lilac creme with a touch of holographic sparkle. No complaints with either formula or application and the swatches show 3 thin coats by itself. Isn't this such a great shade of purple?! Majestic Magic "is a glitter topper. Blue, purple, pink and white glitter topper with aqua dot glitter. Looks best over black.". Again, as with Heartbeat, I had no trouble at with the formula or application and the swatches below show 2 easy coats over Honeymoon Avenue, topped with 1 coat of ellagee's Fast Dry Top Coat. So pretty! 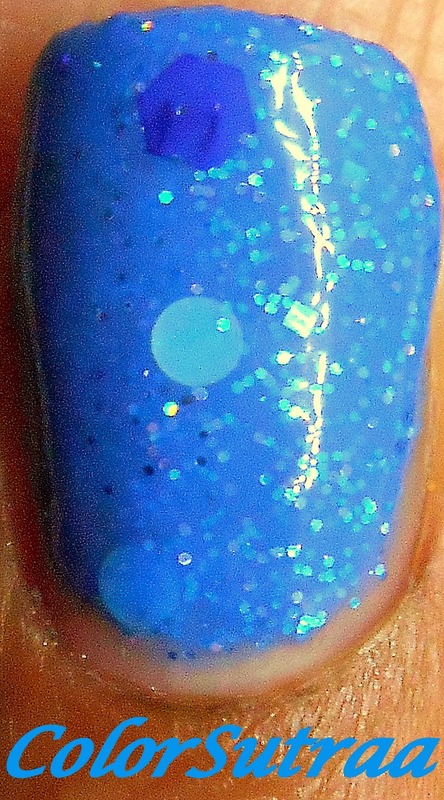 Treading Water is described as "medium blue jelly base with navy blue, shimmering bright blue, aqua, and holographic glitters in varying sizes." Great application and formula--the swatches show 3 thin coats, topped with 1 coat of ellagee's Fast Dry Top Coat. This may just be my favorite! So there you have it, my darlings! Your first look at 5 gorgeous creations from Majestic Lacquers! If you would like to add any of these pretties to your stash, you can find her store HERE--a full-size, 0.5 mL bottle can be yours for the price of just $9.00! You can follow Vick of Majestic Lacquers on FACEBOOK and on INSTAGRAM for all the latest news and updates! Treading water is my favorite!